The immanent model of dharma training is well known for its epithet of being a ‘practice of no practice’. The paradoxical nature of this form of training found traditionally in China, Japan and Tibet is one that so easily defeats the Western mind as this generally will only accept something that fits its logical conditioning. 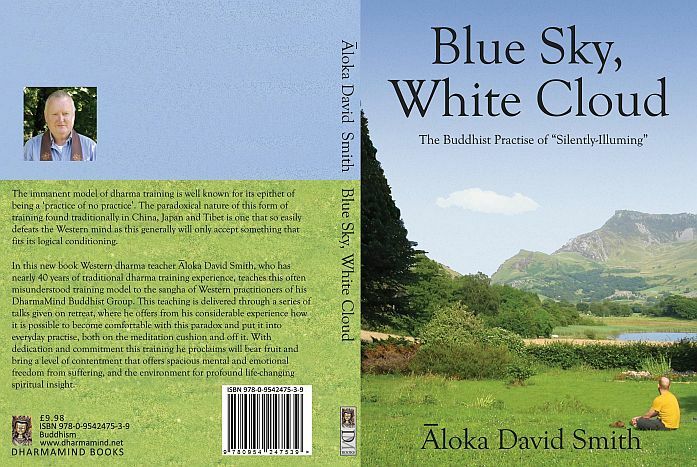 In this new book Western dharma teacher Āloka David Smith, who has nearly 40 years of traditional dharma training experience, teaches this often misunderstood training model to the sangha of Western practitioners of his DharmaMind Buddhist Group. This teaching is delivered through a series of talks given on retreat, where he offers from his considerable experience how it is possible to become comfortable with this paradox and put it into everyday practise, both on the meditation cushion and off it. With dedication and commitment this training he proclaims will bear fruit and bring a level of contentment that offers spacious mental and emotional freedom from suffering, and the environment for profound life-changing spiritual insight. Silent illumination, or silently-illuming as I prefer, expresses both the fulfilment of training, which awakens us to our fundamental condition, and the training itself. A training that leads to spaciousness and stillness through learning to let go of habitual attachments, that reveals mental silence and the natural awakening of our innate wisdom and compassion. It becomes a discovery of our natural luminous condition before the world of ignorance and delusion is created. We begin to discover this when we learn to return and stay with our everyday experience of awareness, because our everyday familiar state of awareness is the direct and only gateway to our true nature. In many ways it is enough to be still for insight to arise from within, but there is also the danger that this peaceful state may encourage us to simply bask in its natural condition of peacefulness and mental and physical bliss; retreat into it as a sort of pleasurable comfort zone that inevitably leads to dulling the edge of potentially deeper awakening. Indeed, down the centuries, this form of training has been accused of doing precisely that, and only promoting dullness through a lack of stirring natural energy (virya) that would be generated through active insight contemplation. In China this trap is exposed with this traditional Chan warning: ‘The mountain is dark, so there is nothing to see; and in the cave of ghosts, what can one accomplish? ‘ So this potential danger is accepted to be a very real one.